The breakfast was great, room was clean, pool was beautiful, staff was great. We liked everything!! The staff was wonderful! We were able to get a room quickly. We arrived earlier than check in time, because i have cancer I need to rest quite often in the afternoon. So they worked to get our room before that check in time. Where to find Ocala hotels near an airport? Where can I find hotels in Ocala that are near tourist attractions? You will find yourself simply spoiled for choice when it comes to securing comfortable places to base yourself in Ocala. On Expedia's comprehensive database you can find 20 lodging options within 0.1 kilometres (0.06 miles) of Ocala's downtown. 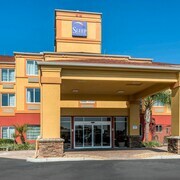 There are only a handful of hotels within easy walking distance from the center of Ocala. 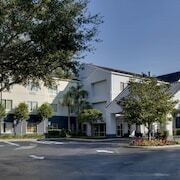 The Homewood Suites by Hilton Ocala at Heath Brook is an ideal choice as it is just 3 kilometres (2 miles) away. No trip to Ocala would be complete if you don't take a visit to the Appleton Museum of Art. 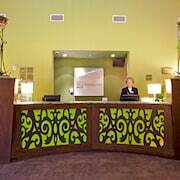 The Holiday Inn Express Hotel & Suites Silver Springs - Ocala and Days Inn Silver Springs/Ocala East, are within walking distance of Appleton Museum of Art. 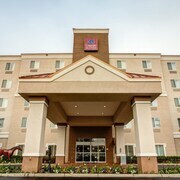 The Residence Inn Marriott Ocala and Hampton Inn and Suites Ocala are both located a short distance from the Paddock Mall. The Residence Inn Marriott Ocala is 1 kilometre (1 mile) away from the Paddock Mall. The Hampton Inn and Suites Ocala is 1 kilometre (1 mile) away. Families, students and the thrifty will find some lovely Ocala hotel and apartment options that definitely won't raise the bank manager's eyebrows. 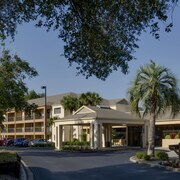 6 kilometres (3 miles) from Ocala's downtown area is the Best Western Ocala Park Centre. 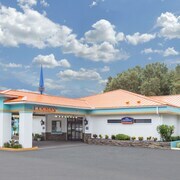 The Quality Inn is just 6 kilometres (4 miles) away. The Super 8 Ocala and the Motel 6 Ocala Conference Center are two more economical accommodations worth checking out. 12 kilometres (8 miles) from the heart of Ocala, is the Seven Sisters Inn. The The Waterfront Inn is positioned 35 kilometres (20 miles) away. Two other Expedia-listed accommodation options include the TownePlace Suites by Marriott at The Villages and the Van der Valk Golf Resort Inverness. To experience more of the wetlands in this section of United States of America, you may choose to plan to spend some extra time in other parts of Central Florida. Whether you engage in common regional activities, for example hiking, picnicking and bird watching, or just travel around to explore the attractions, you will be able to book comfortable places to stay in the area. Eatonville is 100 kilometres (61 miles) to the southeast of Ocala and is where you'll find Zora Neale Hurston National Museum of Fine Arts and St. Lawrence AME Church. The Park Plaza Hotel and The Alfond Inn are some of the Expedia-listed hotel and apartment alternatives in Eatonville. Alternatively, you could consider staying at Lake Mary, 95 kilometres (59 miles) to the southeast of Ocala, where you can pick from the Orlando Marriott Lake Mary and Residence Inn by Marriott Orlando Lake Mary. The Sylvan Lake Park and Timacuan Golf Club are a couple of the most popular sites to check out when you're in Lake Mary. Gainesville Regional Airport is a convenient option for getting in or out of Ocala. It is 65 kilometres (40 miles) away. Sweetwater Branch Inn is a nearby hotel. What are the most popular Ocala hotels? Are there hotels in other cities near Ocala? What other types of accommodations are available in Ocala? Explore Ocala with Expedia.ca’s Travel Guides to find the best flights, cars, holiday packages and more!